Grow your own San Pedro Cactus. The Echinopsis pachanoi is a fast growing cactus. 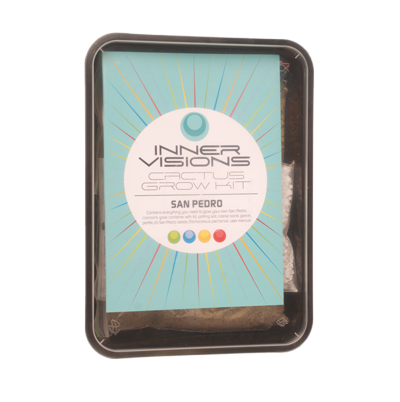 It is easy with the San Pedro Cactus grow kit! The grow kits package contains 20 Echinopsis pachanoi (Trichocereus Pachanoi) seeds and comes with detailed grow instructions. 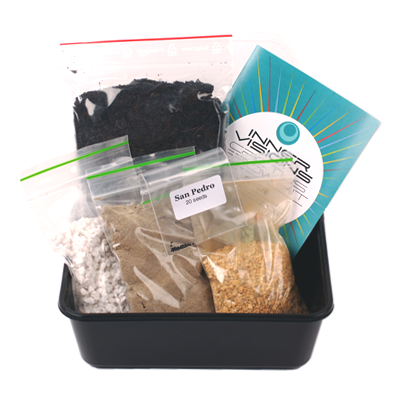 Soil and a growing container are included too. A San Pedro cactus can grow up to 30 cm a year! This San Pedro cactus, is growing in the beautiful Andes Mountains of Ecuador and Peru on an altitude of approximately 2000–3000 m. It is also found in Argentina, Bolivia and Chile, and it is cultivated in other parts of the world. The San Pedro cactus contains several alkaloids, including the well known mescaline (0.21–1.8%) There are numerous mescaline extraction techniques, simple (simmering in water 5 to 7 hours) and complex (such as an acid-base extraction), the latter technique yielding a material with a significantly higher concentration of mescaline. In most countries it is legal to cultivate the San Pedro cactus, but in countries where possession of mescaline and related compounds is illegal and highly penalized, cultivation for the purposes of consumption is most likely illegal and also highly penalized. This is the case in: the USA, Australia, Canada, Sweden, Germany, New Zealand, and Norway, where it is currently legal to cultivate the San Pedro cactus for gardening and ornamental purposes, but not for consumption.